on the cost of a piano refinishing job. Please note: This is a loose-leaf print-out of the digital version. The price includes printing & mailing. Bring out the original beauty of your piano. your friends will really admire your work. "How To Refinish Your Own Piano". This chapter deals with the very important steps required for taking your piano apart for refinishing. I have included a special chapter on taking a Grand Piano apart. Many professional re-finishers don't follow these steps properly and they often have to call a technician to help them get the piano back together again so that it works properly. This chapter is a must, if you are going to do your own refinishing. Also included in this chapter are plans to build your own piano tilter. One person can easily tilt a piano over on its back so the pedals can be removed. It is also much easier to work on the sides of the piano when it is on the tilter. This tilter is my own personal design included FREE. This is the most unpleasant part of the job. It is very messy and you have to work with hazardous materials. I have revealed guidelines here to make the job as easy and safe as possible. I have also included easy FREE plans for building your own stripping tank. This all-important part of refinishing a piano is covered in detail so that you get the most satisfying results without damaging the veneer. Choosing the right stain can be a real challenge with the many varieties on the market, all claiming to be the best. In this chapter I discuss the various types of stain and how to choose the one that will work the best in your own situation. You must not miss this chapter! Many refinish jobs have come to grief when this step is not followed. It is no fun having to start all over again after you have just put on your final coat of finish! In this chapter I reveal the peculiar problems that can be encountered in refinishing pianos and how to avoid disaster. What is sanding sealer? Do I need to use it? Do I need to fill the pores of the wood? What is the difference between an "open" and a "closed" grain finish? I have uncovered the answers to these important questions in this chapter. There is no mystery to obtaining a good finish job if you just have some basic knowledge about wood and finishing products. There are only two basic types of finish for you to choose from. I explain the difference between them as well as the proper procedure for applying different finishes. This is called "Finishing The Finish". This is what makes the difference between a quality finish and one that is nothing special. Include this step in your finishing schedule and listen to all the compliments you will get for a "professional" job! Usually the hardware on a piano can be polished up to look like new again. It all helps to give your work a very professional appearance. It is worth while taking the time to make everything nice and shiny! Putting the piano back together again will take the better part of a day. Take your time and be careful not to damage the finish in the process! I have included some helpful hints on how to manage this part without spoiling your hard work. Cleaning and Polishing an Ivory Keyboard. Frequently in refinishing a piano you will find the need for some piano parts and supplies. These have often been difficult for the "non-professional" to obtain. I have provided links here to various sources for practically anything you may require. PLUS my FREE plans to build your own piano tilter and strip tank. Don't delay! This makes a great summer project! "Thanks for sharing your knowledge and experience with the rest of us out here. 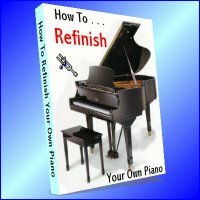 "How To Refinish Your Own Piano"! BUY NOW HERE! only $29.95 USD for a limited time. Just ask and we'll refund your money. Period.